We have a proud history of providing cutting edge thought provoking shows and showcasing a diverse range of art from hundreds of talented artists from around the world. We could not have made it this far without you. No art experience necessary! Free! In this hands-on workshop, participants will learn how to release inner thoughts and feelings using a universal vocabulary of expressive line gestures and color on paper. Their awareness and ability to use intuitively understood elements to express their feelings in a creative, communicative, and therapeutic manner will be increased. All Art materials needed for the workshop will be provided. This is an experiential workshop suitable for both those with no previous experience in art and also those with more advanced experience who seek to further develop their expressive drawing skills. 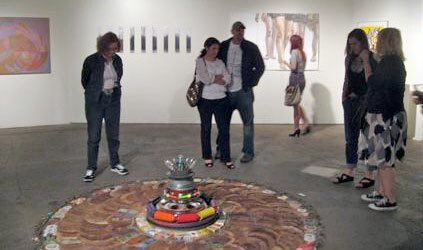 OCCCA alumnus, Janice DeLoof has been an exhibiting artist and an instructor of art in Southern CA for over 35 years. Enrollment is limited to 15 persons. Although I have taught some 25 years in the Newport Beach area on levels from Middle School to University in Art and Foreign Languages, my serious ambition has always been my painting, drawing and printmaking. I feel very fortunate that for over two years now I have been sharing my interest and love for Art with three groups in need of care and understanding in our present day society. Two groups are young people in de-tox houses and the third is in the Lynn House for indigent women sometimes also in need of de-tox. I bring my Art as Therapy to these young men and women in their de-tox houses once a week in three different locations: two for women and one for men. We have a common love for Nature and a similar Spiritual Program. My own Art is abstract and large, however, with the young people, I go back to representational studies on a smaller scale with Nature as our guide. Saturday, November 6th, at 2.00 pm. Are We Failing Our Students? "The general topic, of course, will be “Are We Failing Our Students?” My position on this is, yes, we are, but being a panel, there will be room for debate and discussion, and also talking about how we can improve going forward. Personally, I am coming from the viewpoint, not only of a working artist, but also of a teacher and of a gallery director. In my experience meeting with students and young hopeful artists, I am seeing that several important areas are being neglected in our educational system. One deficiency is not demanding a firm grounding in the basics at the undergraduate level, another is a complete lack of preparation of the students to be able to make a living in their chosen field (art as a business), a yet a third is a de-emphasis on background (the history of art). We have given the students so much freedom to be “creative” and do what they want, they are often missing important basics, and by hiring teachers who have graduated from this kind of system, we are in danger of falling into the trap of perpetuating this type of mediocre education, because some of the teachers themselves possibly lack proper training. The determination and work-ethic of the individual students is of great importance in their being able to utilize their knowledge and their degrees, but all of the factors I mentioned combine to make success in the field of art extremely difficult." The portrait is art's attempt to account for identity, to make sense of what it means to be an individual. It is art's way of grappling with being a subject, with subjectivity itself, and in a sense is as old as art itself. Both art and individual identity emerge at the same historical moment: the simple outlined handprint on a cave wall. These earliest human gestures are where art history textbooks begin. The same handprints are also evidence of the first notions of "I," the first self-conscious mark, signaling the moment of recognition of one's own being. The first work of art is also the first graphic evidence of identity: it is, precisely, a self-portrait. While the origins of portraiture might be quite simple, even Romantic, contemporary identity, contemporary art, and therefore contemporary portraiture are decidedly complex. Nationalisms, the loosening of gender constructions, and reconsiderations of race, are just several obvious examples of the limitless number of pressures currently being brought to bear on the most essential of questions: "Who are you?" At the same time, art itself continues to redefine, reassert, and reconfigure ideas of representation and expression, and so while many participants in the contemporary art world would like to dismiss it, we are (despite the embarrassment it causes some of us) grappling with variations of the resilient question, "What is art?" It is these two channels of urgent, fundamental questions, "Who are you?" and "What is art?" that come together in the portrait. All portraits are negotiations between identity and representation, between being a subject and portraying a subject. This panel and discussion event will be held in conjunction with an installation entitled “Genealogical Differences” that Janice DeLoof is exhibiting in the OCCCA 30 Years Anniversary exhibit. Information will be given about "The Human Genome and Its Impact on Modern Medicine" as well as information about some of the current research on genetics at UCI. Time will be allotted for a questions and discussion on how personal knowledge of one’s genome would be beneficial to the health of individuals with mental illness and other illnesses and the problems anticipated with this knowledge. Dr. Lu Forrest, a researcher in the UCI Department of Physiology and Biophysics, moderator; J. Jay Gargus, M.D., Ph.D. Professor; Dr. Rob Steele, PhD, Professor and Interim Chair, UCI Department of Biological Chemistry; Adrian Preda, M.D., Associate Professor of Psychiatry and Human Behavior; Phyllis Gallagher, RN, MA in Bioethics, JD, and Janice DeLoof, MA, Artist.